Already thousands of years ago people came to the Piller saddle and were captivated by the "sheer view" and the fascinating vista of the Upper Inn Valley. In those times, it had been travellers who took the demanding path over the Alps. Today, for us motorcyclists, this road up to the Piller saddle is just great fun to ride. Located on the northern shore of Lake Lugano, Lugano has a very comfortable Mediterranean climate. It is one of the three warmest towns in Switzerland – and the largest Italian-speaking town outside of Italy. The pedestrian-only old town and the promenade along the lake shore are perfect for a little walk. If you want to see the town and the lake from the top, you can take a sidetrip to one of Lugano’s mountains, Monte Salvatore and Monte Brè. To get to Zermatt you have to leave your motorcycle in Täsch and take the shuttle train. On July 13th, 1865, the locals saw seven climbers, four British accompanied by one guide from Chamonix and two locals, attacking the peak along the northeast ridge - the one that faces Zermatt. Being very lucky with the weather conditions, they reached the summit the next day and scored a victory over a party of climbers who, unaware of them, had set off to reach the summit from the Italian side. At 51 km (32 miles) long, up to 18 km (11 miles) wide and with a surface area of 143 square miles Lake Garda is Italy's largest lake. This remnant of the last ice Age measures up to 350 m (1,150 ft) deep. During WWI even war ships were patrolling the lake, bullet holes in the city walls of Limone are testimony to this chapter of history. The northern coast is rocky and rugged while in the south it is flat and smooth. The entire region is famous for its beauty and the mild climate, making it possible to grow top-quality lemons, figs and olives. In the 19th century Lake Garda was a popular destination for the rich and beautiful from all over northern Italy. Magnificent villas and other beautiful vintage buildings date from that period. 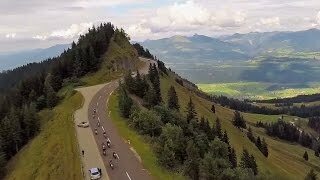 If there is a place on earth that's made for the eye, the camera and our bikes, then it is surely the Alps. We know this region very well, it is our home, and we make sure you don't miss a single experience. We’ll pick up the motorcycles in the Edelweiss hometown of Mieming and enjoy the first challenging mountain passes on our way to Pontresina, Switzerland. From there we explore more of the wonderful roads the Swiss Alps have to offer until we reach Brunnen. The road to Brunnen is already spectacular and the town itself is a highlight with its view on the lake Vierwaldstättersee. The next day we’re off to Zermatt, where you can watch in awe as the setting sun colors the snow-covered Matterhorn in a deep crimson. And it's getting even more enchanting. Lugano in Italy is where we go next and this place is simply indescribable – the pictures taken in Lugnano will surely decorate your walls at home for the rest of your life. Then we head to the Val di Sole and on to Klobenstein/Bolzano, through the beautiful Dolomites. 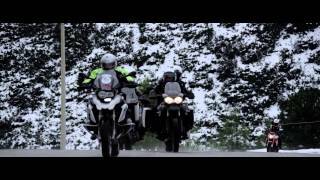 If you could take only one Alpine motorcycle trip in your life, this is the one we would recommend. Accommodations: Comfortable middle-class hotels with a special alpine touch. The most important aspect of travelling is the journey. And Edelweiss Bike Travel made sure our participation in the Ultimate Alps Tour is a memorable one. The tour was not just wonderful because of the quality bikes, we stayed in great hotels, could experience challenging routes and travel with people who have the same attitude than we do. And the tour guides were great too. We had an outstanding trip experience and have collected so many postcard-like pictures which are saved on our cameras and in our mindes. Well done Edelweiss – keep up the good work and excellent customer service. We will be back soon! The team of Edelweiss Bike Travel wants to say thank you to Dexter Ford for participating in our The Ultimate Alps Tour and for putting together such a great report about our tour in the February issue 2014 of Rider Magazine.  It was a great tour! I am looking forward to my next Edelweiss tour!